New patch library feature: MIDI keyboard! 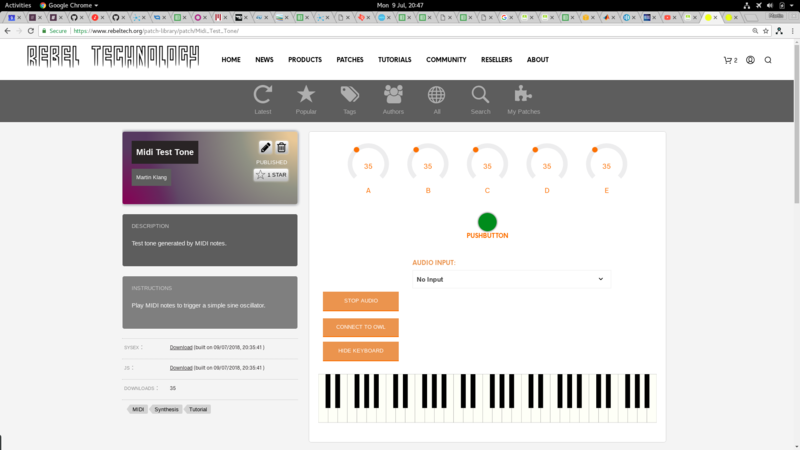 We've deployed a new version of the patch library with a fun new feature: built in (virtual) MIDI keyboard! From now on, when you go to a patch and hit Play you will see an extra button: Show Keyboard. Click this button and you will see a bed of virtual piano keys. You can play the keys with the mouse, or with a QWERTY keyboard: row a, s, d, f, et c for white keys, and w, e, t, y, u for black keys. And you can change octaves up or down with 'z' and 'x'. Same mappings as Ableton Live. The keyboard doesn't make any sound itself, it only sends MIDI signal to the patch running in the browser. So the patch needs to know what to do with it! Existing patches (Pure data and C++) with MIDI support should work fine but will need to be recompiled to support the new scheme.